Can being uncertain of your social rank be bad for your health? (UC DAVIS, Calif.) – Having strong social connections has many benefits – from the opportunity to split the tab on a pizza to having someone to binge watch “Stranger Things” with on Netflix. But for rhesus macaque monkeys at the California National Primate Research Center (CNPRC) who are uncertain of where they rank in their social order it can mean the difference between being healthy or not. 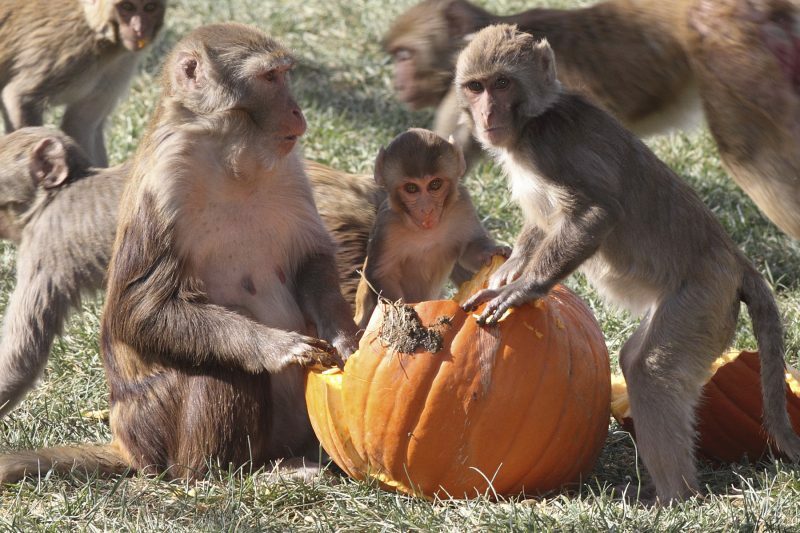 In a recent study published in the scientific journal PeerJ, researchers at CNPRC have shown that having an uncertain position in the rhesus social hierarchy may be harmful to the health of those at the top of the hierarchy but not necessarily for those at the bottom. Monkeys don’t have friends lists or Instagram followers, their social rank isn’t governed by computer algorithms but by many complex factors explains Drs. Jessica Vandeleest and Brianne Beisner, first authors of the study. Still, the monkey model established by the researchers could one day help doctors learn more about the way that social hierarchy affects the health of humans. The researchers shared their findings in PeerJ (Vandeleest et al. 2016) in an article entitled “Decoupling social status and status certainty effects on health in macaques: a network approach.” The team found that social rank and rank uncertainty predicted key risk factors for poor health, specifically pro-inflammatory proteins (C-reactive protein, interleukin-6, and tumor necrosis factor-α) which are risk factors for chronic diseases like cardiovascular disease and diabetes. Doctors Vandeleest and Beisner, of the Department of Population Health & Reproduction, School of Veterinary Medicine and the CNPRC Brain, Mind and Behavior Unit, and collaborators measured the level of certainty or uncertainty of the monkeys’ social status in captive rhesus monkey groups at CNPRC. They did this by observing how the monkeys interacted with each other – in cases where the monkeys were not interacting directly with other monkeys, their relationships were inferred through mutual social connections. The team – led by Professor Brenda McCowan, PhD, whose work focuses on using computational systems science approaches to examine the complex relationships between social life and health – used these indirect connections to decipher the social rank of the animals and how well they fit in the hierarchy. They discovered that high ranking monkeys with low certainty of their social status showed higher markers of inflammation, which can be a sign of a chronic disease state such as diabetes, than those with very certain status. So high-ranking monkeys may experience some health risks, but only when their position is questionable and they are consequently at risk of losing their status. The opposite pattern was found for low ranking monkeys – high dominance certainty was associated with higher markers of inflammation whereas low certainty was associated with lower levels of inflammatory proteins. Monkeys that are uncertain in their low rank might have opportunities for upward mobility in the hierarchy, which may be associated with better health outcomes. 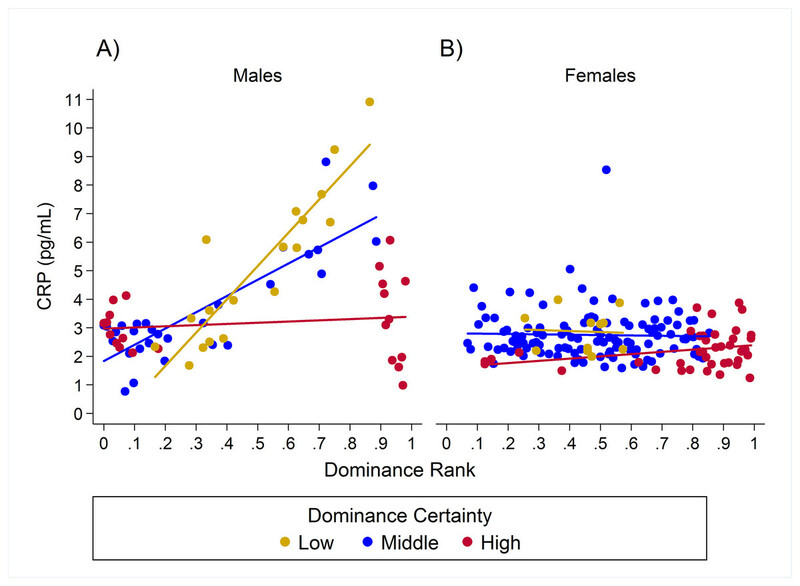 Figure Legend: This figure illustrates the effects of rank and dominance certainty on predicted CRP levels for males (A) and females (B).